For over 30 years, we have been delivering fair-priced tree removal service in RI and MA. From residential to commercial, we handle it all. ​Sepe Tree is the best tree company to hire for tree cutting on residential and commercial properties. 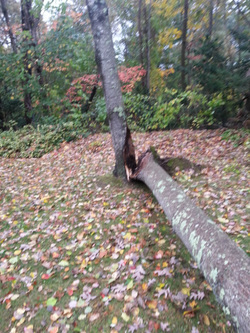 Our RI tree removal service company offers free estimates and affordable tree cutting options. The arborists at our tree company specializes in dangerous, dead, difficult, large and complicated tree removal services on oaks, pines and hardwood trees all over the great state of Rhode Island and MA. If you need a traditional tree removal or the removal of a dead or hazardous tree, we can work with you. We can diagnose the health of your trees. We have an ISA-Certified Arborist on staff. We can make sure that your tree is not a liability to your property or the people who pass by it. If it is, we will make plans to remove it immediately and expertly. We can tackle your project, no matter the size or scope. We are prepared for just about anything when it comes to your trees. Remember – we work with both businesses and residences so we can take on any job that comes our way. Tree Removal - Why should a tree be cut down? There are many reasons for cutting down a tree from your home, Lot, Land or commercial property. Trees that are dead, dangerously leaning or dying may need to be removed so damage is prevented. If your tree is leaning over your home high winds can bring the tree down. Some trees might be pulling up your foundation of your home, driveway, sidewalk, or a man made structure, and should be cut down. You may have new construction going up and your tree could be in the way. Or if your lawn or garden can not get enough sunlight, then tree removal service might be the only choice for new grass growth. Sepe Tree Services and removal options will help you remove any unwanted tree with an affordable price and quality service. We bring personal attention to every Tree Removal.